President Paul Kagame today arrived in Luanda, Angola to start a two-day working visit. During the visit, he met and held talks with his counterpart President João Lourenço. Today, the two Heads of State held a meeting before attending a luncheon hosted in honor of President Kagame and the visiting delegation. The visit is expected to serve as an opportunity to strengthen bilateral cooperation between the two countries and existing areas of partnerships including air transport, security and justice, migration, ICT and governance. Tomorrow, prior to his departure, the two leaders are expected to address a press briefing. 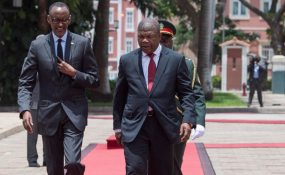 Rwanda and Angola have a number of bilateral agreements including technical advice and information exchange in law enforcement that will see both countries cooperate in security and public order in the interest of their citizen. The agreement was signed this year. The two governments last year signed a Bilateral Air Service Agreement under which the national carrier, RwandAir, and Angola's national airline Taag got seven frequencies a week on either side. Rwandan citizens traveling to Angola are not required to have visas to enter Angolan territory.